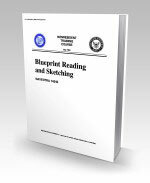 14040.pdf - Pages: 200 - 14040 Blueprint Reading and Sketching - Covers blueprint reading and drawing with examples from several fields of work where blueprints are normally used. 14063.pdf - Pages: 372 - 14063 Illustrator Draftsman 3 & 2, Volume 1, Equipment - This is one of four in the DM training series. Volume 1 is an overview of general shop administration; equipment, equipment capabilities, limitations, and maintenance; and required operator adjustments. 14064.pdf - Pages: 348 - 14064 Illustrator Draftsman 1 & C, Volume 1, Equipment - This is one of four in the DM training series. Volume 1 is an overview of general shop administration; equipment, equipment capabilities, limitations, and maintenance; and required operator adjustments. 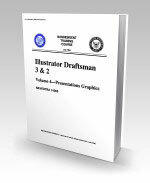 14065.pdf - Pages: 276 - 14065 Illustrator Draftsman 3 & 2, Volume 4, Presentation Graphics - This volume is Volume 4 in the DM training series. The training manual and separate NRTCs in Volume 4 cover the following subjects pertaining to presentations graphics: prepress copy preparation, television graphics, displays, exhibits, and audiovisual presentations. 14066.pdf - Pages: 268 - 14066 Illustrator Draftsman 1 & C, Volume 4, Presentation Graphics - This volume is Volume 4 in the DM training series. The training manual and separate NRTCs in Volume 4 cover the following subjects pertaining to presentations graphics: prepress copy preparation, television graphics, displays, exhibits, and audiovisual presentations. 14262.pdf - Pages: 586 - 14262 Illustrator Draftsman 3 & 2, Volume 3, Executionable Practices - This is one of four in the DM training series. This volume covers the theory of color, photography, computer-generated art, figure drawing, cartooning, animation, mediums, lettering, and airbrush. 14263.pdf - Pages: 550 - 14263 Illustrator Draftsman 1 & C, Volume 3, Executionable Practices - This is one of four in the DM training series. This volume covers the theory of color, photography, computer-generated art, figure drawing, cartooning, animation, mediums, lettering, and airbrush. 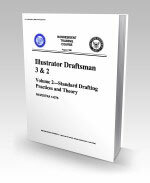 14276.pdf - Pages: 488 - 14276 Illustrator Draftsman 3 & 2, Volume 2, Standard Drafting Practices and Theory - This volume is Volume 2 in the DM training series. The training manual and separate NRTC cover the following subjects pertaining to standard drafting practices and theory: composition, geometric construction, technical drawings, and perspective and parallel projections.